If you still think that to say that “rulers of this age” (demons) crucified Jesus means that they crucified him in one of the heavens you have missed my recent post, What they used to say about Paul’s “rulers of this age” who crucified the “lord of glory”. More easily forgivable, you have also missed or forgotten a series by Roger Parvus back in 2013, in particular A Simonian Origin for Christianity, Part 7: The Source of Simon/Paul’s Gospel. In the first of those posts I quote from the Gospel of Nicodemus (also known as the Acts of Pilate) the crystal clear belief that the head demon was responsible for crucifying Jesus on earth. Roger Parvus presents the argument that Paul believed Jesus descended to earth where he was crucified by the demonic forces. 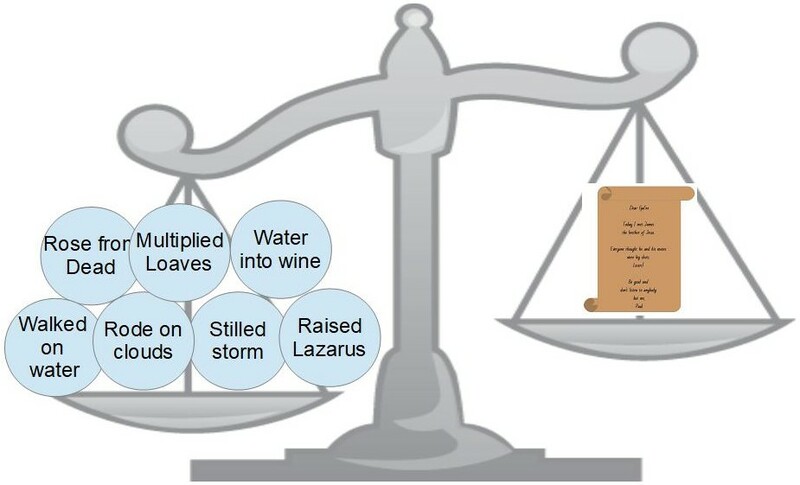 Parvus’s argument draws upon an analysis of the Ascension of Isaiah to support his case. While it is certainly not impossible that demons who are busy fighting each other in the lower heavens could also crucify a Jesus who had descended from upper heavens for that purpose, I personally favour Roger Parvus’s view. Jesus descended to earth for a short time for the sole purpose of being crucified, descending into hell, being resurrected and returning to his original place in heaven. The historian is stunned. His faith has taught him that James was only a cousin or half-brother. If he was wrong about that, he wonders, how can he even be sure Jesus existed at all? Reeling in doubts, the historian is nonetheless conscientious and no fool. He knows he has to test this document for its authenticity. So he snips off a corner of it and sends it to the laboratory to determine the age and provenance of the material. As an extra check he sends a high definition copy to a paleographer. The results come back. The material is dated between 40 AD and 60 AD and the paleographic analysis confirms that the style to what was typical of the year 50 AD. Next, he asks if the letter is genuinely by Paul. His colleagues tell him it sounds just like the Paul they know so that is confirmed. Since this is evidently an autograph questions of the contents of the letter being altered during the process of copying do not arise. But how reliable are its contents as historical evidence? Our historian asks if we can verify that this particular James really was known to be the literal brother of Jesus. He consults the latest scholarship on the book of Acts and discovers that it is now established “beyond doubt” that the first chapters, 1-15, were written in the year 45 AD and that the original text said that James was not only the head of the church but was also the junior brother of Jesus, one year younger to be precise. The contents of Paul’s letter are confirmed! But our historian is more thorough still. Did anyone else in the early church know anything of this letter and its contents? He pores through Tertullian’s writings and sees that Tertullian quotes the passage about meeting James to refute Marcion’s heresy that Jesus was not really a flesh and blood human being born of a woman on earth. That clinched it! The letter and its contents sure seemed to be genuine and known to be genuine by the venerable Fathers. But our historian is a Bayesian. At least he thinks he is. He read half of a blurb on the back cover of a book that had Bayes written on its front cover and is confident that he got the hang of it from that. 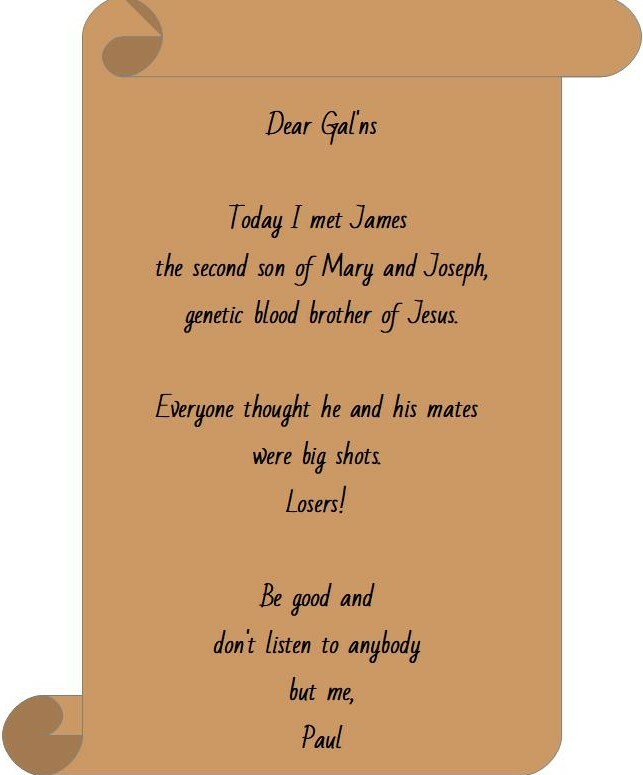 If he was wrong about Jesus having brothers how can he be sure Jesus even existed? The historian pauses to think of all the unbelievable stories about Jesus. Could such a person really have existed in the first place? So he puts on what he thinks is his Bayesian cap that looks very much like one of those conical dunce caps and sets to work.